Here, in our latest blog, we look at the recent updates in our builders’ metalwork ranges. These include a host of new ‘How to’ videos and a reminder of our service commitments, which include free of charge next day delivery anywhere in the UK. If you are merchant reviewing your builders’ metalwork offer and want to grow your sales we can help. Whether you are new to builders’ metalwork, or simply looking to give your existing offer a kick start, our highly experienced team can guide you through the process. One of the most common questions we get asked by merchants is; what builders’ metalwork ranges should I stock? With so many different products, you need to be work with a supplier like us that understands the market and knows what your customers are needing them for on site. 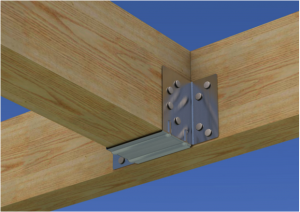 Joist hangers represent one of the largest sectors in the fixings’ market and you might want to make sure that it forms the core stocked range within your branch. This is closely followed by items such as restraint straps and angle brackets, with most branches having them in stock or offered on short leadtimes. It helps that we offer free of charge next day delivery anywhere in the UK, so you can offer a wider range of builders’ metalwork without having to have large inventories. A preference to use timber by many contractors and developers means that timber to timber connectors are growing in popularity and we can advise you on what are the best products to meet this demand. 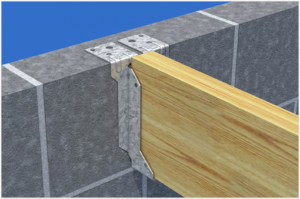 Timber to timber as well as timber to masonry fixings should form the basis of any builder’s metalwork range in your branch as they are used on all construction programmes. Having the correct stock profile for builders’ metalwork is essential if you are looking to grow a larger customer base. Contractors, builders and roofers will all make your branch a destination if you have the right builders’ metalwork stock profile. You may also want to bear in mind that builders and contractors usually choose their own builders’ metalwork because it is unusual for it to be specified by an architect. 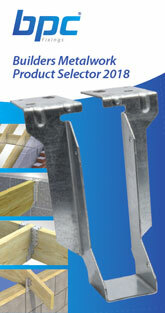 As a guide, in terms of quality, timber to timber joist hangers should be made from either galvanised steel to BS EN 10346:2009 DX51D or stainless steel to BS EN 10088-2 Grade 1.4301. They also need to comply with the Construction Product Regulations (CPR) and be CE marked where necessary in order to demonstrate compliance. Both walls, floors and roofs inevitably involve a need for a large quantity of metal fixings and so getting the right stock profile in place will ensure that you have a rapid turnover of stock. Over the years, manufacturers of constructional fixings have developed a range of standardised designs, which means that merchants can meet the majority of customer needs by having a tight, core range of stocked items. As well as offering you guidance on the most appropriate range of builders’ metalwork to offer, our website will provide you with some very useful support material. The latest of these is a series of ‘How to’ videos that help you understand specific product ranges as well as helping your customer understand how they are installed on site. Our latest ‘How to’ videos include a number of builders’ metalwork ranges such as ‘How to install vertical and horizontal restraint straps’, ‘How to install timber to timber joist hangers’ as well as ‘A guide to stainless steel wall starter kits’. There are many other videos, too, which is why it’s worth regularly visiting our website at www.bpcfixings.com. As construction sites become ever more complex and building performance more stringent it’s essential to have the right product ranges in your branch. If you are looking to review your builders’ metalwork offer with a view to growing sales, we can help. Call our experienced team today on: 01924 364794.